Breastfeeding is a global public health issue, with key health benefits to mother and baby. Breastfeeding rates in Scotland are low within an embedded formula feeding culture. The promotion, protection and support for breastfeeding is therefore acutely important and should involve all age groups. This project was designed to increase knowledge of breastfeeding among young people living in an area of North Ayrshire where breastfeeding rates were critically low; only 17% of women are exclusively breastfeeding at 6-8 weeks compared to the Scottish average of 26.8%. Led by infant feeding nurse (and Queen’s Nurse) Liz Smith, the aims of the project were that children, young people and communities have increased knowledge and are able to make healthy and informed choices about feeding babies as well as having a better understanding about the barriers to breastfeeding and why community support is important. The project was created in partnership with NHS Ayrshire & Arran, North Ayrshire Health and Social Care Partnership, North Ayrshire Council and The Breastfeeding Network (BfN) to engage with children and young people. Short, age-appropriate interactive learning sessions were planned, with activities including classroom sessions relating to breastfeeding which were presented to 1,188 pupils across early years, primary and secondary. The programme was able to reach a large audience in a short space of time and in an area with a formula feeding culture. Evaluation showed that pupils, and staff, enjoyed the sessions and they engaged in the learning and activities. Pupils seemed to particularly enjoy interactive activities such as completing worksheets on their daily food and drink intake, the breastmilk demonstration and group work, such as matching baby animals to their mums. The results of this project will be made widely available and results will help inform the development of a national programme for breastfeeding and early nutrition sessions in schools. The project was run by Elizabeth Smith, then Community Infant Feeding Nurse withing NHS Ayrshire and Arran. 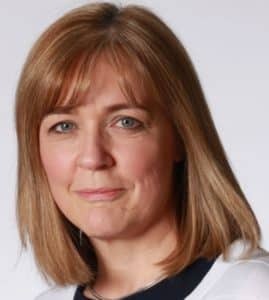 Now the Breastfeeding Advocacy Lead for Scotland, working for the Scottish Government, Elizabeth is also a Queen’s Nurse, and further information on her can be found here. Being funded through Catalysts for Change allowed us to test and develop these sessions for nursery, primary and secondary schools. This work can now be taken forward as part of a national programme to introduce children and young people to breastfeeding and discuss early nutrition. This forms part of the culture change work within Scotland, addressing the low breastfeeding rates and embedded formula feeding culture in many areas. The children and young people who were participants in the project engaged well with the subject and were happy to share their thoughts in the relaxed atmosphere of the interactive sessions. One primary school pupil said they would like to know why babies have breastmilk, instead of ‘normal’ milk, another said they found the session ‘disturbing’ and one saying ‘it was weird’. These comments highlight the issues in the community and the need for the sessions. Based on the findings from the sessions delivered, it is clear that attitudes to breastfeeding were mixed, but amenable to change through information and discussion.